For those who have the psychic capability to see spirits, this guardian will appear as an African Hunting Dog (Lycaon pictus). In addition to the standard Guardian capabilities, it has superb psychic tracking ability, can become 'flame' in psychic combat, and may grant its owner increased stamina and aid in communication with the dead. 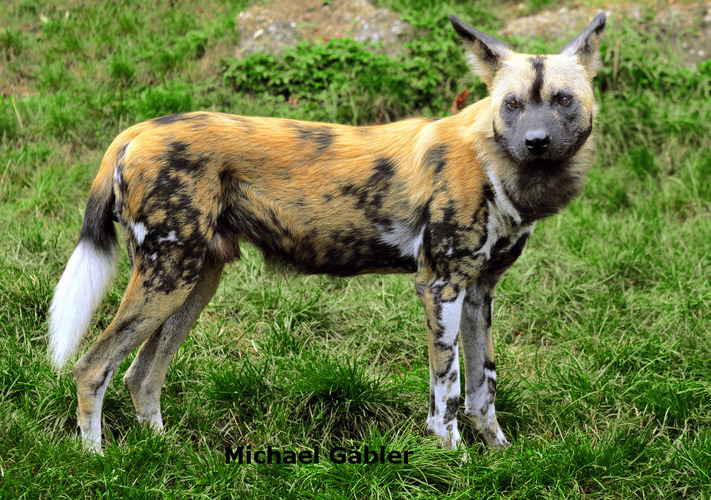 About Lycaon pictus: The beautiful and critically endangered African Wild Dog, also known as the African Hunting Dog, Cape Hunting Dog or the Painted Hunting Dog, is a wild canine native to Africa. These highly social wild dogs live in packs of 2 to 100 (with an average size of 12 to 21 now, with their numbers so reduced). Hunting dogs are one of the world's most efficient predators, with an average pack having a recorded success rate of up to 85%. (This means that 85% of what they chase, they kill). Hunting dog packs have a unique hierarchy among wild canines. While the alpha female of a pack is usually the oldest (though her sisters may also be subordinate pack members), the alpha male is often one of the YOUNGEST adults. If one of the alpha pair of a pack dies, then one of the youngest adult males of the pack will assume the alpha position--even if the alpha male is alive. He abdicates his position to his son (or an unrelated young male pup that has been adopted) without a fuss. Then all of the remaining females in the pack leave, and join a different hunting dog pack. The all-male pack that remains is then prepared to adopt any other emigrating females that locate them. This social arrangement, characterized by low aggression and a 'youth first' protocol among males, is very different from the way most pack species operate, and means that this species inherently protects itself from inbreeding. It may also explain why Hunting Dogs have never been domesticated. Male hunting dogs are hardwired not to obey an elder male who is not their father. Only the alpha pair in a hunting dog pack will have pups. If other females happen give birth, the alpha female will take the pups and suckle them with her own. Once the pups begin eating solid food, the entire pack helps to feed them. Guardians are created spirits, formed and patterned from psychic and magickal energies. Entities of this type are called servitors, constructs, or energy golems. Just like summoned spirits, this entity is intelligent, and has a personality and the ability to learn and grow. They are created to remain completely loyal to its owner, and to love and serve them. If the item is passed to a new owner, the servitor will serve and guard its new owner just as faithfully as it did the first.